Last week, I posted the article, 5 Things Parents Want Teachers to Know. If you did not get a chance to read that post, I encourage you to do so by clicking the link above. The importance of the relationship between teacher and parent at the beginning of the school year cannot be overstated. If you are a teacher, parent, or both, be encouraged in your relationship today. You are connected by the strongest link – your child. I will protect your child with my life if necessary. I truly understand how precious this child is to you because I have one of my own. Sometimes when I’m in the classroom, I look around and plan out exactly what I would need to do to protect him in case of an emergency. That may seem silly or overprotective to some, but that’s the role of the lion keeping watch over the cubs. The kids get excited when we have a fire drill, but I take it seriously. I keep my room keys with me at all times, and if anyone ever tried to get into that room without my consent, he would have to get through me. That sounds pretty bold, I know, but that's just how I feel about it. Most importantly, I pray for our classroom and our school. I hope this gives you peace. I have a heavy responsibility to you and to him. I will not take it lightly. You can trust me. When we sit down in a room together or conference over the phone, know that I’ve spent hours thinking about what to do to help her be successful in my classroom, in school, and in life. I want to give her skills that will help her not just today, but as she continues on to the next grade-level and beyond. I’ve even stayed awake at night thinking about it. I can help; I want to help, but I don’t want to overstep my boundaries. She is your child, and I respect that. Allow me to be a part of seeing her grow, mature, and thrive. The progress she makes gives me the greatest satisfaction as a teacher. I like your child. I only say this because sometimes kids will take it personally if I need to correct them in class. It’s not personal, and it doesn’t mean that I don’t like him. He may come home and tell you that I hate him. Sometimes it’s hard for him to see that I have a responsibility to each and every one of the kids in the classroom. If I let misbehavior slide, it could affect the ability of another student to learn. Tomorrow will be a better day. He will be reassured by the smile on my face when he sees me that I care about him. And believe me, I do make mistakes! When I do, I will take time to talk with him about it. This will strengthen the trust he has in me as his teacher. She’s going to be OK. Each day of school has its share of ups and downs. She may not make the volleyball team this year. Her best friend may decide to hang out with someone else. She may fail a test, forget her homework, or spill her drink at the lunch table. These things will seem like the end of the world to her now, and you and I will both want to rush to her rescue. But the experiences she has this year will shape her into the beautiful adult God intends for her to become – unique, compassionate, strong. She will be growing and changing right before our eyes, and I have the privilege to be here and to see it happen. Next to you, I’m his biggest fan. Some days he will think I don’t see him, but I do. His eyes speak volumes – sometimes eagerly wanting me to call on him, other times hiding behind the kid in front, not wanting to talk. Either way, I will respect him. I will pray for wisdom to know what to say and when to say it because I know he will remember every word. I’ll choose my words carefully. With the constant demands teachers face, I may sometimes get sidetracked with all we have to accomplish, but I refuse to use lack-of-time or a busy schedule as an excuse. We’re not producing cookie-cutter-kids here. I will acknowledge him, accept him, appreciate him. For all he is today and all he is yet to become, I’ll be right there on the sideline cheering him on. Thank you for letting me. As a parent and a teacher, I feel especially blessed to have a clear perspective on the importance of this relationship forged at the beginning of each school year. Both parent and teacher are truly passionate about that one common link that binds them together – the child. 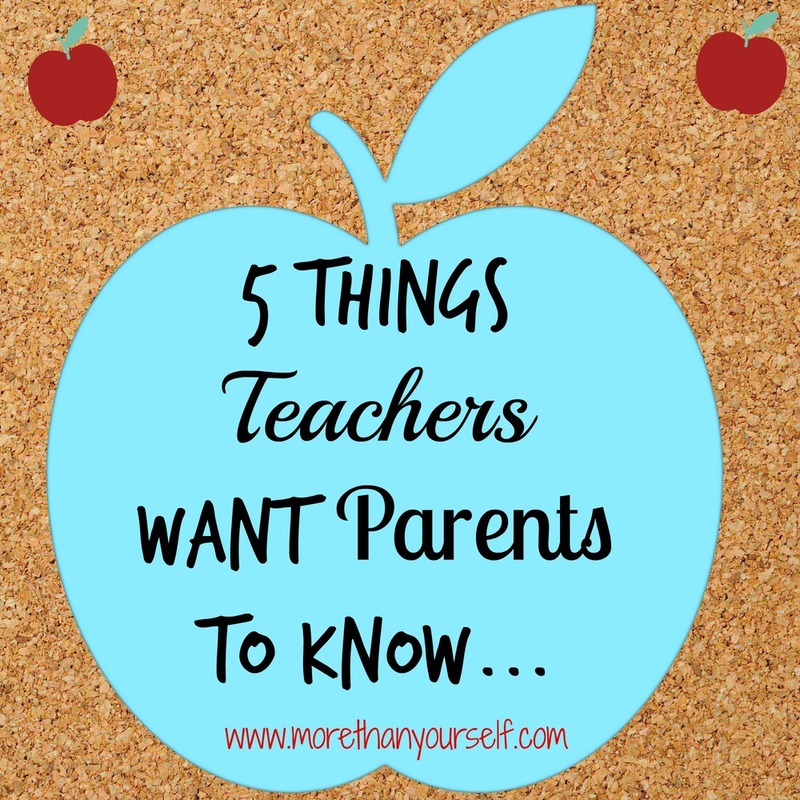 Today, I am sharing 5 things parents want teachers to know. In next week’s post, I will follow up with 5 things teachers want parents to know. If you happen to be a parent, teacher, or both, I pray the thoughts expressed here resonate with you. I believe how we embark on this adventure each August sets the tone for the year, for us and for our children. 1. I willingly place my most precious possession into your care each day. Please don’t take it lightly. Have you seen the news lately? It’s enough to rattle even the bravest parent right to the core. Every day I drop her off at the front of the school, watch her walk in, and say a silent, urgent prayer for protection. As hard as I try to think positive thoughts, sometimes my mind wonders what terrible things could happen today while we’re apart. I think of myself as the mamma lioness going out to gather food for the day, intent on bringing back a good meal this evening. Will you stand guard over the cubs, taking care of them in my absence as you would your own? We are all part of the same pride, and I would do the same for you. 2. You will spend more time with him today than I will. By the time I get home from work today, I will have about 3 hours to spend with him before bedtime. As much as I hate to admit it, you will have more influence on him as an adult role model than I will. This makes me feel empty and sometimes helpless, but I accept it. Our weekends are precious to us! That’s our family time, and we live it to the fullest. If you give homework on the weekends, it may not get completed. Sorry in advance. 3. Your relationship with her will help shape who she is 20 years from now. Make it count. Think back to your time as a student. Which teachers do you remember fondly, and which not so much? As a parent, I can do ten positive things for my child and make one negative comment. But guess which thing she will remember? I honestly don’t know why. Maybe it’s that innocent vulnerability or impressionable faith in adults. Whatever the reason, please keep this at the forefront of your mind when communicating with her. She trusts you. And if you make a mistake, because we all do, for heaven’s sake, apologize! Kids don’t hold grudges. 4. He is not like the others, and that’s a good thing. His quirkiness will catch you off guard some days. In fact, it might be downright aggravating, especially if it interrupts your lesson. But try to see how his behaviors will translate into adulthood. I mean, who wants to be a grown-up who fits into a mold, anyway? His uniqueness sets him apart and makes him remarkable. Can you find ways to use those moments as learning opportunities for him and the other students? It is then you will see the best of him and what he can do. Thank you for being flexible. 5. See her. Some days she feels unnoticed, under-appreciated, unloved. Some days she wants to act out because she thinks the misbehaving kids get more attention. Though this breaks my heart, it’s a part of life and growing up. She deserves to be acknowledged. All kids do, and I understand how hard that will be for you this year. The sheer number of youngsters you see in a given day would make my head spin! But I know you’ll find a way. God will give you the strength to do it. After all, making kids feel special is every teacher’s super-power. Yes, that’s probably the most important of all – see her. Though she may never say it in words, she'll thank you for it. Have a great year. I'll be praying for you.